As the popularity of Android has boomed, more and more malware is targeting the platform. Digital miscreants are using fraudulent developer accounts on Google's Play marketplace to spread malware. According to latest Mobile Threat report from F-Secure, Android malware continued to gain in share in 2012 and was responsible for 79 percent of all threats for the year, up from 66 percent in 2011, but Google developer responded with,"F-Secure can say that anything is malware". F-secure report said, In the fourth quarter alone, 96 new families and variants of Android threats were discovered, which almost doubles the number recorded in the previous quarter. According to official Google figures, there are over 700,000 apps and games in the Play marketplace and malware on Android jumped 850 percent between 2012 and this year. Whereas an Google Android developer reply to TechCrunch technology generalist ,"They say they detected Trojans but they didn't explain what were their effects on the system, because if they did, everyone will know they’re not really Trojans that’s only what they want you to think". F-secure report also claimed that a large share of the Android threats found in the fourth quarter was malware that generates profit through fraudulent short message service (SMS) practices, with 21 of the 96 Android threat variants found contributed by Premium SMS, a malware family that sends out messages to premium rate numbers. "F-Secure can say that anything is malware, even ‘dodgy sms’ which doesn't fall under the definition of malware…. They say they detected Trojans" Google Android developer reply. 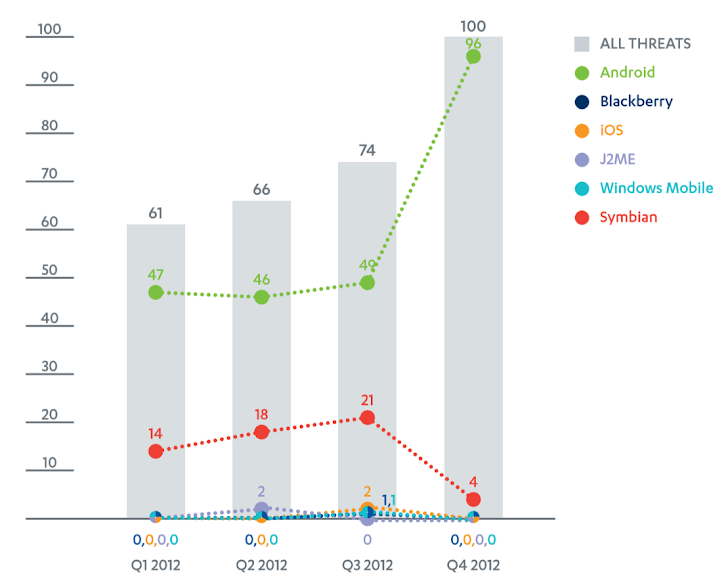 Apple iOS on the other hand accounted for only 0.7% of all malware and Windows Mobile, BlackBerry, and J2ME devices each accounted for less than 1% of malware threats during 2012. On other hand, Symbian still accounts for 19% of all malware despite being abandoned by Nokia, F-Secure says.